We offer various request options depending on location (stack, open access) and borrowing status (available, on loan, not on shelf). Some of our resources incur a cost (you will be informed of these at the time of request). Your library account will only be charged once the items are available for collection. You may submit your requests on site at the catalogues or from home via www.voebb.de. You will need your library card and password for this. Once you have found what you are looking for, follow the request process simply by clicking the “Single request” button on the far right. The request will then be shown in your user account overview. You may place requests for items available in our stacks. These stacks are not openly accessibleand are only available through the request function. Processing time: Items are generally ready for collection after 30 minutes; in exceptional cases they may only be available after 60 minutes. If you want to collect items the same day you requested themyou will need to submit your request by no later than 7.35pm (6.35pm on Saturdays). Requests placed from Monday to Thursday for items from our external stacks can be collected from 3pm the following day. Requests placed Friday to Sunday will be made available from 3pm on the Monday. These items are freely accessibleand may be taken directly off the shelf and borrowed during opening hours. You cannot place order requests for items held by the library you are currently in. Processing time: Order requests are processed once a day Monday to Friday. **This is not an automatic reservation. There is a possibility the item may be borrowed by another visitor before the request can be processed. In this casewe will not be able to process your requestand you will not be charged. Reservations are requests for items on loan or otherwise not currently available (e.g. being set uptransportedrepaired)regardless of their location (stackopen access). Processing time: Depends on the reason for the item’s unavailability. For “on loan” statusesyou will be able to seeat the time of requesthow long the item will be on loan for. If it has already been reserved by other usersyour position in the reservations list will be shownand you can use this information to calculate an approximate processing time. This canhoweverend up being shorter or longer if the item is returned early or is kept beyond its due date. The processing time cannot be calculated exactly for “not on shelf” statuses. Enquire at our service desks or information desks if necessary. We offer the option of having the items delivered to another library or to your home for an appropriate fee. Periodicals and newspapers cannot be borrowed, except for the periodicals from the Children’s and Youth Library and Burda magazines. All periodicals (except for usually just the latest issues) can normally be borrowed at the city libraries. The periodicals are arranged by subject area at both library facilities. Issues from the last year (in the case of newspapers, usually just the latest issue) are available in open access. Older years and issues are kept in the stacks and need to be requested. All copies more than five years old are kept in the stack at the Berliner Stadtbibliothek (Berlin City Library). Periodicals and newspapers can only be used on site. They cannot be collected from any other location. You are, however, welcome to make use of our article delivery service. Bound volumes of periodicals and newspapers may be requested through the catalogue. Select the item type as “Periodical/Newspaper”. 1.Search using the title or ISSN. 2.Follow the branching options for issues or volumes. 3.Choose your desired issue or volume, and then follow the rest of the request process. In these cases, please contact our information desks at the library or call the service hotline. You can check whether something is ready for you to collect at any time under My account --> "Show or delete collections” at www.voebb.de. Or use the free service which automatically notifies you by email, SMS or post when items are available for collection. Simply select “Yes” in the “Receive notification by letter, email or SMS when ready for collection?” field when submitting your request. You can enter your email address or mobile number under “My account --> Manage email / SMS” at www.voebb.de. **We cannot be held liable for undeliverable notifications. For each request, you can choose whether or not you wish to receive a notification. Your requested items will be available in the self-collection area. 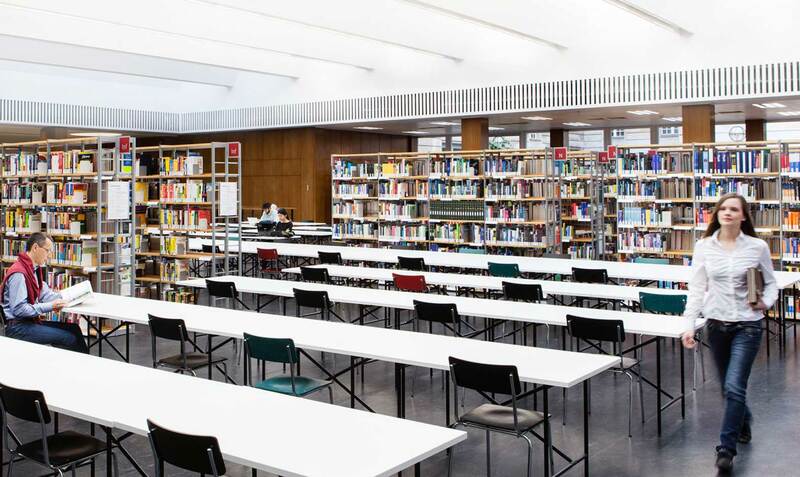 * At the Berliner Stadtbibliothek, items are collected on the basement level/in the foyer of the reading room. Use your collection code to collect your requested items. You can see this collection code online on your library account, and it is also shown on every notification letter. Please check out your requested items directly at the terminals in the collection area. Don’t want to take your requested items home? Simply let one of our staff know.